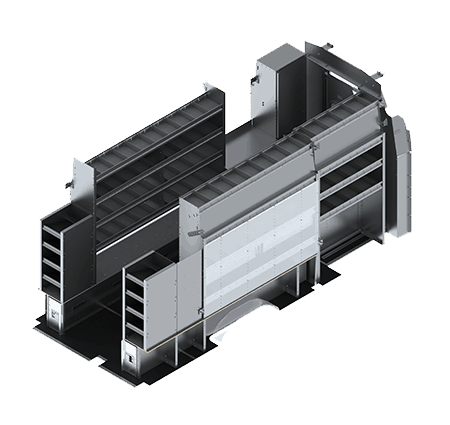 Ranger Design helped a large utility fleet downsize its vans for an easier fit in urban areas, all while maintaining the same amount of storage space. Our goal was to develop a downsizing solution that would provide a more city-friendly driving experience without diminishing service capacity. This package was designed to get the most out of the available cargo space. Decreasing van size while increasing storage space. 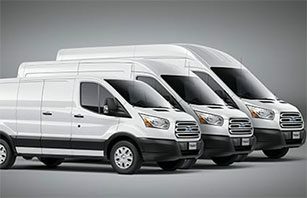 The main challenge here was downsizing the fleet vans from box trucks to the Ford Transit without sacrificing storage. 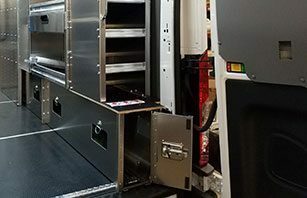 Our engineering team worked to create a lightweight aluminum package that maximized use of the cargo area once the vans had been downsized by 26 percent. Creating ergonomic storage solutions. Another issue was finding room for all the items needed at the job site. We had to create an area for long pipes that were usually left loose on the floor. We came up with a design for extended pipe holder cabinets installed under the shelves. These kept the pipes from rolling around freely while also taking advantage of an infrequently used area of the van. Ensuring easy access to tools and equipment. To grant technicians quick access to their tools, a shelf was created across the side door of the van to make it possible to reach the tools without necessarily entering the vehicle. 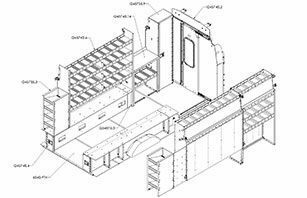 In addition, holders for small, loose parts were built into the back doors so that technicians would be able to reach the tools they use most from the ground. Ready to Talk to a Consultant?